The Allegany Museum will be providing children’s activities on Saturday June 9 alongside Cumberland’s Heritage Days event. The Museum’s George Washington Whiskey Rebellion Celebration, brought to you by the Community Trust Foundation, has invited nationally-renown George Washington ‘living biographer’ Karl Cross to interact with children and their parents. The First Virginia Regiment will portray the Virginian Militia as mustered to be part of the Federal Army that marched from Fort Cumberland. They will hang out in children’s area to talk about the militia, and will provide some wooden guns for children to march with. All re-enactors participating in the Whiskey Rebellion Celebration events have been sponsored by Carl Belt Inc.
Children will be able to make their own models of Washington and of Fort Cumberland, take pony rides from noon to 2 pm, have their pictures taken with ‘George Washington’ and ‘Alexander Hamilton’ cut-outs, and also participate in painting ‘Kindness Rocks’ in red, white and blue, then placing one word or short phrase on the rock that describes being kind to others. These painted rocks will be the start of the ‘Allegany Museum/Allegany County Kindness Rock Painting Project’. Suzanne Trussell, an archeologist devoted to the history of the Cumberland area, will lead tours of the Fort Cumberland area, and other historic points of interest. 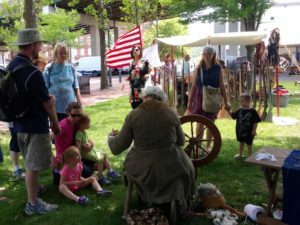 The Museum’s George Washington Whiskey Rebellion Celebration will also be providing a beer tent for adults in another area of Washington Street. The George Washington Whiskey Rebellion Fest kicks off the Washington heritage celebration on Friday June 8, 6 to 10 pm, in the Allegany Museum, 3 Pershing St Cumberland MD. Guests at the Fest will also enjoy continuous servings of canapes by Good Carma catering, an open beer and wine bar, the opportunity to mingle with ‘George Washington’ and other reenactors including George’s wife. Tickets also include the opportunity to play Colonial games, win one or more unique luxury items in the silent auction, photos with President Washington, and a goody bag to take home. Sober rides are available. Tickets are available at the Book Center, Centre St Cumberland, Main Street Books in Frostburg, through the Whiskey Rebellion Cumberland Facebook page or just click here. ← Welcome back to the Fest, Lyon Distilling Company!